I was born and raised in East Anglia where I spent my early twenties in Cambridgeshire, producing creative food for my own freelance cooking business. I was lucky enough that my cooking skills took me all over the world, and I was able to develop my painting skills as a hobby in my spare time. After meeting my husband, Paul, in Cambridge, we established our own vegetarian food business, Wicken Fen Wholesome Foods. In 1997 we moved north to set up our much-loved bed & breakfast business, The Hollies, in the beautiful town of Berwick upon Tweed. 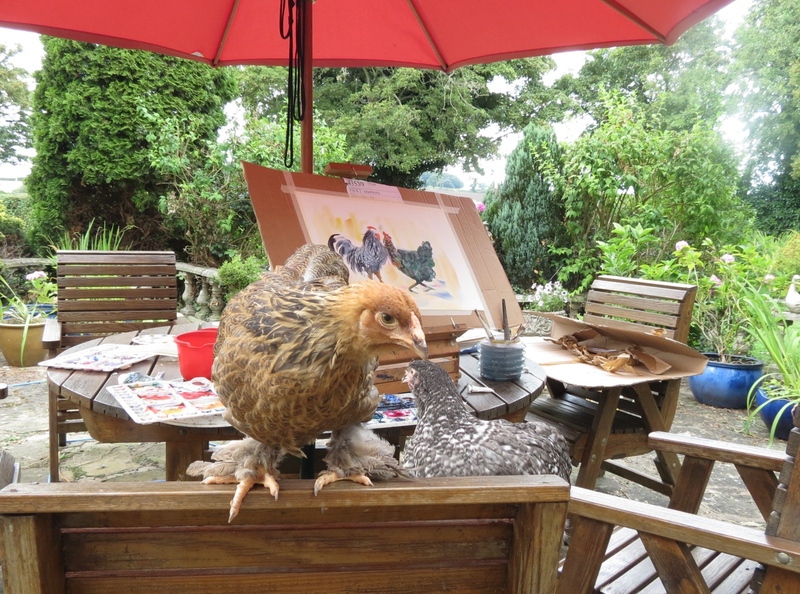 Moving to The Borders enabled me to further develop my love of painting, and I discovered just how much I love painting animals. In July 2014, we relocated to Alpheton in Suffolk where we are busy setting up our current bed and breakfast business in a wing of the house with stunning views across the Suffolk countryside. 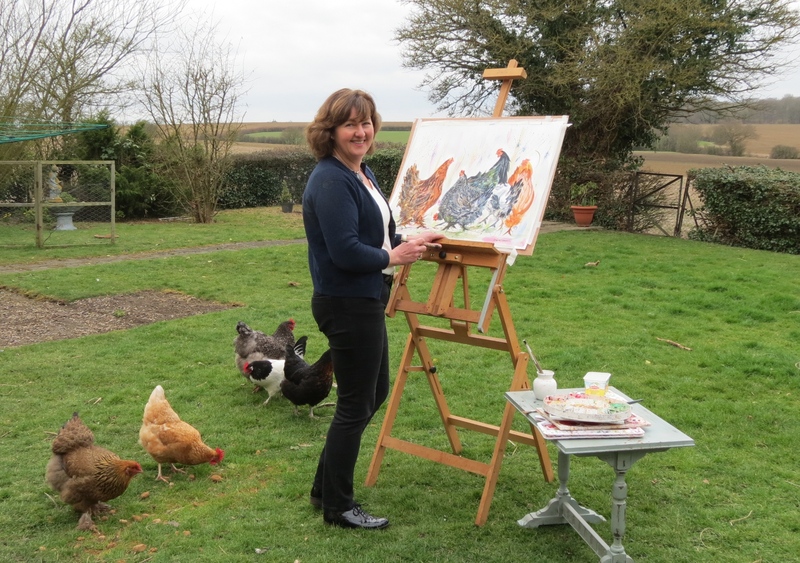 It is my very own chickens that live here in my back garden that give me so much inspiration for my paintings and range of country gifts. My main muse are my 5 hens – all of which are extremely lively, with their own individual characters. 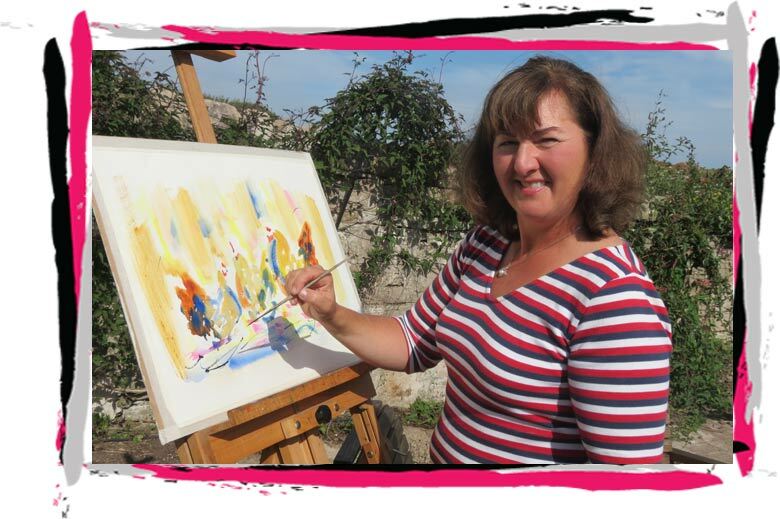 It is these characters which keep my paintings fresh and colourful with plenty of movement ……I hope you enjoy looking at them as much as I enjoyed painting them! Penny and Blackie I inherited last year when we moved. Penny is a wonderful nosey bossy character but is not laying any eggs! she is the golden brown one, Blackie is the dark hen, Bella the Brahma very friendly and allows me to pick her up sometimes, Mary the Maran the greediest of them all and Vera the Lakenvelder the loaner, she often goes off wondering on her own. I have been getting on a good day 4 eggs, but now Bella has gone broody! Vera has decided she doesn’t want to sleep in the hen house with the other hens and is roosting 6ft up a tree next to the house! They love me painting outside and always so inquisitive. I am looking forward to lots of warm sunny days this summer. Luckily my studio has french windows to the garden and my models are never far away!